Share with friends and family unique experiences in Lisbon. Voucher accommodation with breakfast included. View terms and conditionsBuy now! Not sure what to get that person you would love to surprise but already has everything? Do you have a friend obsessed with minimalism who always says he/she does not want anything more? And what about that other buddy who you owe the world to and would like to thank with a special gift? Offer a different night with wonderful food. 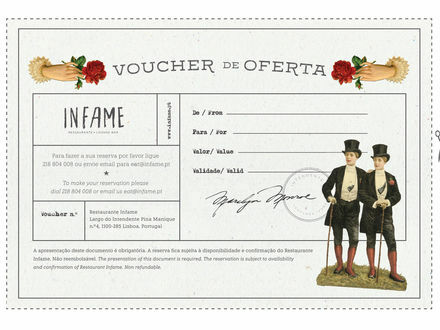 Give an Infame voucher or keep it to yourself. and chose a value (starting from €25). 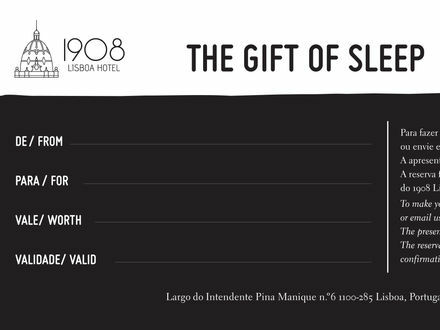 The Lisboa 1908 welcomes people from all over the world! Standard rate with beakfast included. Cancellation Policy: Free cancelation 3 days before arrival. Late cancelations will be charge the first night. Payments: Will be charge a prepayment of the total price at any time. Non refundable rate with breakfast included. Please note, if cancelled or modified, the total price of the reservation will be charged. In case of no-show, the total price of the reservation will be charged.